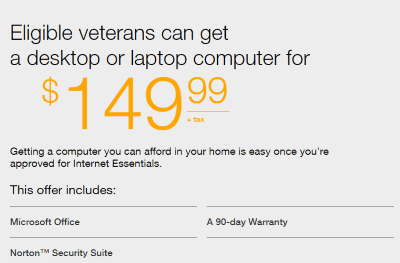 Comcast announced this week it is expanding its $9.95 discount internet access program Internet Essentials to qualified low-income veterans. Comcast requires all applicants, including veterans, to pre-qualify for the service with an application and agree to submit re-qualification paperwork annually. The cable company has carefully shielded its program from cannibalizing existing internet revenue by excluding almost everyone who currently subscribes to Comcast internet service or has a pre-existing past due balance. Applicants have to certify they have not had Comcast internet service for at least 90 days before submitting an application (not applicable to customers in the city of Philadelphia), must prove their low-income status by sending proof they are enrolled in one of several federal assistance programs, and prove their veteran status. In the seven years of its existence, Comcast has only managed to enroll six million people in the program, a fraction of those that would otherwise qualify who live in Comcast service areas. 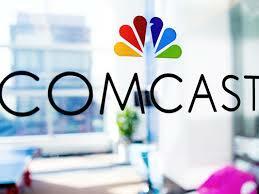 Most critics blame Comcast’s onerous qualification requirements for the relatively low enrollment. Bryan Mercer, executive director of West Philadelphia’s Media Mobilizing Project, told The Inquirer Internet Essentials offers “speeds that don’t even meet the FCC definition of broadband” and a “series of restrictions” that disqualify those who already manage to scrape enough money together to buy Comcast internet access without the benefit of the Internet Essentials discount program. Mercer says the restrictions that insist customers go without Comcast internet for at least three months and never have an outstanding bill are particularly hard for many low-income people to meet. “That is a real roadblock to someone trying to keep their utilities affordable and their families online,” Mercer told the newspaper. About 70 percent of low-income veterans presently lack internet access. In Philadelphia, the nation’s poorest large city, the contrast between super-wealthy Comcast and the thousands of poverty-level residents is striking. Because of its large low-income population, only about 75% of Philadelphia’s residents have internet access. Detroit, which has seen major depopulation and is no longer deemed a “large city,” is even worse, with only 60.9% of city residents signed up for internet. Nearly half of all adults with an income below $30,000 don’t have home broadband service or a traditional computer, a 2017 Pew Research study found. Low-Income Seniors: (SSI, Medicaid, and other low-income program participation required). Only available in: Atlanta, Boston, Detroit, Fresno County, Calif., Hartford County, Conn., Houston, Miami-Dade County, Fla., Palm Beach County, Fla., Philadelphia, San Francisco, Santa Clara County, Calif., and Seattle. Housing Assistance: Everywhere Comcast is available. Enrollees have to prove they receive qualifying housing assistance. Internet Essentials Philadelphia: Only available in Philadelphia, this program offers less pre-qualification restrictions, but maintains proof of low-income requirements to enroll. Community College: Available only to those enrolled in a participating two-year community college in Illinois or Colorado, and receive a Pell Grant. Comcast was required to offer and finance Internet Essentials as a deal condition for approval of is 2011 acquisition of NBCUniversal. Although that deal commitment expired in 2014, Comcast has voluntarily extended it since then, but reserves the right to change or discontinue the program at any time. It’s great to see when a large company is willing to every once in awhile, do the right thing. It’s too bad they don’t do this more often. They are not doing the right thing by any means. This is simply a PR stunt to make them look good to everyone who doesn’t realize this is a BS program. I am a combat vet who receives 30% service connection (disability) and don’t even qualify for this, and most honorably-discharged vets won’t qualify either. I don’t fall under low income but also do not make enough to afford $70-90 a month for just internet. But people need internet, so I do pay it. Because Comcast has a monopoly on internet in my area. Oh by the way, the 4th qualifier is you can’t have used Comcast for the last 3 months… so basically this program is for senior citizens on MEDICAID. Comcast is about as evil a company gets. If the fine print is that bad, it’s just as bad as Spectrum’s $14.99 Internet Assist. They offer it, but no one can actually qualify to get it. It seemed like it was better, but I see now, it’s on par with Spectrum’s offering. no one can actually qualify to get it. Damn straight. My dad is a WWII vet but not on medicaid (yet). We are not sure how he and my mom will do with Obamacare fees and deductibles but I can’t seem to get him on a cheap Comcast plan for more than a few months at a time. It is sad how Comcast decides whether he is worthy of a lower rate or not. He checks email every few days and the home phone is Ooma VOIP. TV is OTA so bundling is not an option to make costs come down. Nobody really needs more than 25mbit at home unless they are streaming multiple movies at the same time. Most people can get away with 5mbit. Tell that to the next internet sales person who tries to convince you to buy the more expensive internet.